Simon & Schuster, 9781439101209, 496pp. Barack Obama’s inauguration as president on January 20, 2009, inspired the world. But the great promise of “Change We Can Believe In” was immediately tested by the threat of another Great Depression, a worsening war in Afghanistan, and an entrenched and deeply partisan system of business as usual in Washington. Despite all the coverage, the backstory of Obama’s historic first year in office has until now remained a mystery. In The Promise: President Obama, Year One, Jonathan Alter, one of the country’s most respected journalists and historians, uses his unique access to the White House to produce the first inside look at Obama’s difficult debut. What happened in 2009 inside the Oval Office? What worked and what failed? What is the president really like on the job and off-hours, using what his best friend called “a Rubik’s Cube in his brain?" These questions are answered here for the first time. We see how a surprisingly cunning Obama took effective charge in Washington several weeks before his election, made trillion-dollar decisions on the stimulus and budget before he was inaugurated, engineered colossally unpopular bailouts of the banking and auto sectors, and escalated a treacherous war not long after settling into office. Alter takes the reader inside the room as Obama prevents a fistfight involving a congressman, coldly reprimands the military brass for insubordination, crashes the key meeting at the Copenhagen Climate Change conference, and bounces back after a disastrous Massachusetts election to redeem a promise that had eluded presidents since FDR. In Alter’s telling, the real Obama is an authentic, demanding, unsentimental, and sometimes overconfident leader. He adapted to the presidency with ease and put more “points on the board” than he is given credit for, but neglected to use his leverage over the banks and failed to connect well with an angry public. We see the famously calm president cursing leaks, playfully trash-talking his advisors, and joking about even the most taboo subjects, still intent on redeeming more of his promise as the problems mount. This brilliant blend of journalism and history offers the freshest reporting and most acute perspective on the biggest story of our time. It will shape impressions of the Obama presidency and of the man himself for years to come. Jonathan Alter is an analyst and contributing correspondent for NBC News and MSNBC. He is a former senior editor and columnist for Newsweek, where he worked for twenty-eight years, writing more than fifty cover stories. He has also written for The New York Times, The Washington Post, The Atlantic, Vanity Fair, The New Republic, and other publications. 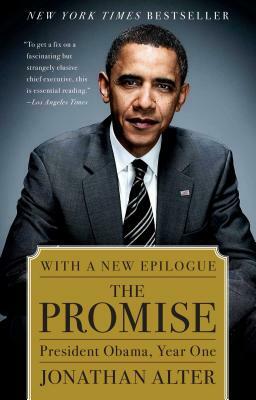 He is the author of The Promise: President Obama, Year One and The Defining Moment: FDR’s Hundred Days and the Triumph of Hope, both New York Times bestsellers, and Between the Lines, a collection of his Newsweek columns.